Like I said in the Leo the Office Dog post, one of the reasons we got Leo when we did was because I was lucky enough to be able to bring him to work with me, and Leo didn’t have to be stuck at home all day by himself with no potty breaks. A few months after we got Leo, Erich started a new job that was, coincidentally, dog-friendly! How crazy is that? Leo never spends the day home alone and pretty much has a choice as to which office he wants to go to, but he mainly comes with me because I love having him with me at all times. If Leo could actually pick, I honestly think he would prefer to go with his dad because he is free to run through the whole office. Whereas, when Leo comes to work with me he usually sleeps most of the day and is a nut when we get home, but when Leo goes to work with his dad, he’s a nut at work and comes home exhausted. Sometimes he can be a little too much of a nut at work with his dad, which is probably another reason he comes with me most of the time. 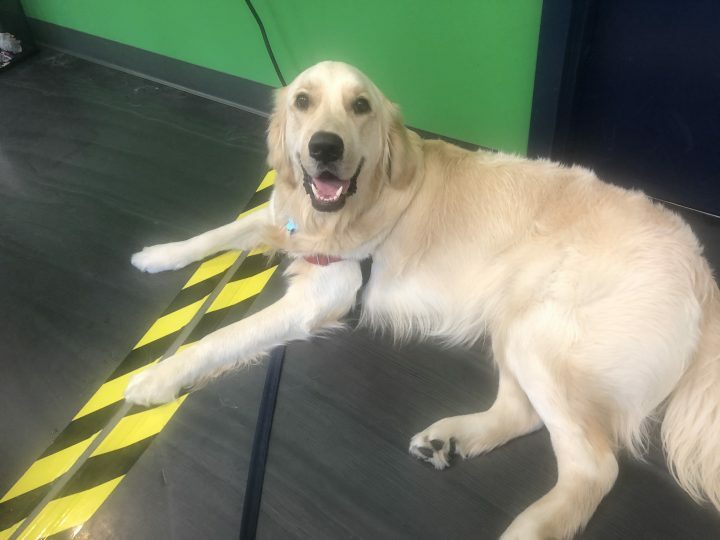 While Leo doesn’t have any potty accidents when at work with his dad, he likes to get into just about everything; think bamboo plants and nudging people for attention. Even though he can be a lot to handle, his dad still loves taking him with to the office because Leo is his best bud too. Have you seen our new commercial yet? ← [Giveaway] Even your pet can go green on Earth Day! what a lucky pup is Leo. i wished that when i was working i could have taken a dog to work. i did not get one because my hours were so long and could not think of having a dog. i thought it would be so unfair for the dog to be at home all day. i had to leave for work at 7am and did not get home sometimes til 6 or later. i know some people that keep their dogs in crates all day while they are at work. how terrible. Leo is one lucky puppy to have such wonderful parents. He is very lucky 🙂 We wanted a puppy so badly, but we were also in a similar situation that made us wait until the right time to bring Leo home.